@Samir55 already contributed to the Slic3r codebase by adding zoom commands (pull request #3864, merged). @Samir55, welcome to Slic3r! Would you please introduce yourself to the Slic3r community? Please mention any experience with 3D printing or similar technologies, and include your time zone and operating system. I'm Samir, a computer engineering undergraduate student, I have some experience in CNC machines and G-code as I am working with my team this semester to make a machine like CNC machine (but we are using a touch screen stylus instead which draws any picture we send to it) . 3D printers are not so popular yet in our country :) so, I have little experience with 3D printers. I dealt with 3D model files (like: OBJ ) in the computer graphics game project . Operating System : Ubuntu 14.04 and Mac OS Sierra . Listing the differences between them and the information each carries. If there are specs or references about the formats that you used, and those are available on-line, be sure to include links in the wiki. Improve and Finalize the wiki draft in this link (Still, needs feedback). See how to improve the proposal. Does Slic3r use the loaded materials from OBJ files? is not used in this function? @alexrj @lordofhyphens I am Studying now Slic3r:: Model and I want to write a documentation for it, I want to include Class Diagram, what each function in the class does, should I include something else? Odds are it's there for growth reasons or to make the reader/writer idempotent (read an obj -> write obj should not lose information). The patches didn't usually make it upstream because the author tended to also have code changes in the same areas, which makes for very messy PRs. Personally, I'd prefer to inline the documentation and generate "nice" docs via something like doxygen, which does a decent job of diagramming C/C++. If you do any documenting in the source, please do (and commit) that first. @Samir55, writing documentation for Slic3r::Model is indeed a useful approach. It will help you a lot when working on 3MF. I agree with @lordofhyphens's suggestion about using Doxygen syntax. It's easy to learn, and it's a nice skill to have for coding C++ libraries. Create a page for it in the Slic3r wiki instead of using Google Docs. The POV format is supported only for exporting, using the --export-pov option of the C++ command line tool (see src/slic3r.cpp). We just provide a handy tool for converting a model to the POVray format, but no slicing or toolpath generation happens there. It's worth mentioning that meshes in STL format don't have vertex indices. This is a very important weakness of the STL format, because in order to find whether two facets are neighbors you need to compare their vertices coordinates numerically (which may have rounding errors) instead of just comparing the indices. You should improve the document by clearly stating what information is officially supported by the formats (you already wrote this) vs. what is supported by Slic3r when reading vs. what is supported by Slic3r when writing (for example, we ignore any .mtl files for OBJ or textures). Another important thing to understand and document is the meaning of the "materials" word. In OBJ, materials are associated to facets, thus they are basically surface attributes/colors which say nothing about the interior of the object. In AMF, materials are properties of volumes, not just their external surfaces. When working on 3MF you'll need to find out what approach does it have. Also, for each format you should clarify how we map its native entities (volumes, constellations etc.) to our Model, ModelObject, ModelVolume, ModelInstance objects. To answer your question, the materials variable in OBJ::read() is declared because the tinyobj::LoadObj() function signature requires it, even if we discard the contents. What is the difference between TriangleMesh mesh() and TriangleMesh raw_mesh() ? What are these functions do? What does DynamicPrintConfig object carry ? What is the difference between Printable and modifier volumes ? In scale_to_fit function , Which size is it ? is it of the viewport or the 3D canvas or what? Why the object may need repair? What are the reasons behind calling repair on meshes? I am now working on Slic3r wiki page in my fork and I'll try to finish very soon. Sorry I and my team are very busy finishing the micro-controller project so, it's taking some considerable time. Objects may need repair because STL is a terrible format. Additionally, the algorithms used tend to want manifold and valid files, so the repair() function is used as input sanitation. A) Consult Model.cpp, lines 589-612. ModelObject::mesh() performs an extra transform (if the model was rotated or translated); ModelObject::raw_mesh() just gives you the mesh as-is without any extra processing. Right there in the source. looks_like_multipart_object() does what it says--checks to see if the Model it belongs to has characteristics of having multiple parts (usually multiple volumes, etc). convert_multipart_object() takes all of the volumes in the Model and combines them into one. duplicate_objects_grid() replicates a single object and arranges them on a grid. It's only used by Simple.pm, which is used only in CLI mode. The two arrangement functions attempt to move model instances around. It's often helpful to employ a text search tool like grep to find the usages of functions in the code. DyanmicPrintConfig inherits from DynamicConfig. Unlike a StaticConfig, the options map is mutable. It can carry anything you give it. See Config.hpp:671-673 (grep to the rescue, determined through the existing comments and looking at what DyanmicPrintConfig inherits from). grep -r DynamicPrintConfig . | grep -v -e "^Binary" -e "\.o:" -e "_build" -e "\/t\/" -e "tiny_obj_loader" -e "XS.c" for usage in the Slic3r codebase. Printable and modifier volumes are both volumes, one just has a flag on it to indicate to the slicer that it represents a different PrintRegion. raw_bounding_box() is the same as instance_bounding_box(this->instances.size()-1), at least from my examination of the source (614-636). It is probably a candidate for refactoring, at least to call instance_bounding_box() with the calculated reference to this->instances.front(). scale_to_fit is whatever size you pass to it. grep is your friend here (or Understand, or any other number of source navigation tools). The 3MF format uses a ZIP format as a container. For reading / writing the ZIP files you may consider bundling the ZIP reader / writer by Disney, which I believe is self contained. We would have to ask @lordofhyphens to check the FSF policies though as it is critically important to include Richard Stallman approved stuff only. Another possibility is to use the wxZipInputStream / wxZipOutputStream classes from the wxWidgets, which I have used in the Prusa3d fork of Slic3r to import the Prusa Control platter files, which are just bundles of STLs with a tiny XML describing the transformation matrices. @bubnikv Slic3r is GPL3-licensed. We work within the rules around here, as @alexrj also prefers. Avoid using wxwidgets in libslic3r code (things that go in xs/src/libslic3r). I've finished the Slic3r supported format wiki document in my fork. tell me if there are any enhancements should be done. 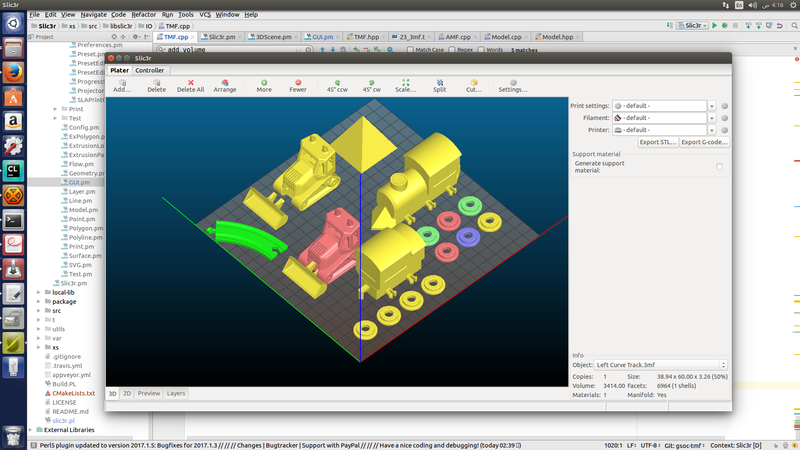 @alexrj Can I create the page in Slic3r wiki now? @bubnikv Thanks for your help, I am also thinking about using minizip and in this thread there is a very simple example about reading a zip file. The Disney ZIP library uses the 3-clause BSD license, which is compatible with our GPL license (as open source software developers, we care about licenses). However, that library looks unmaintained (see this bug report) so it doesn't look reliable. That minizip one looks fine. Here's a comprehensive list. Now that you know the Model data structure and the other formats, study the 3MF format. What does it support? What things should we support? Can we use it to store configuration like we do for AMF? See how to include minizip library. 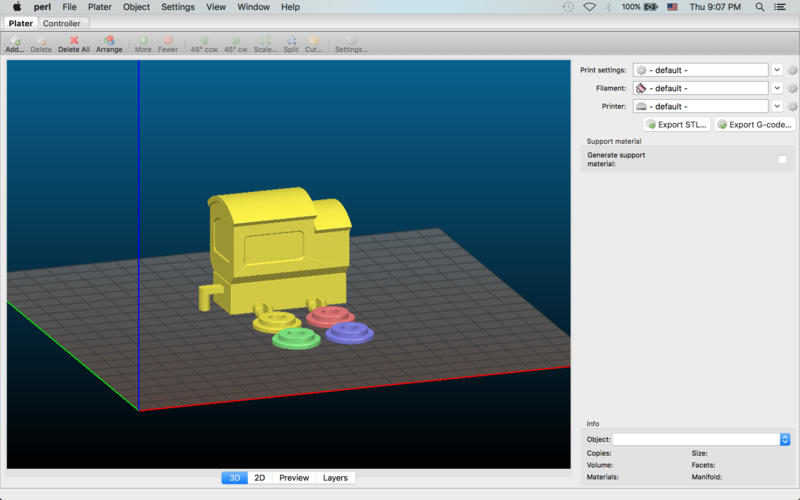 Read Slic3r custom config in slic3r:metadata element. Decompose the 3d affine transformation and apply scale, rotation, and translation to the model instances. Today, I will be working on decomposing the affine 3d transformation matrix. 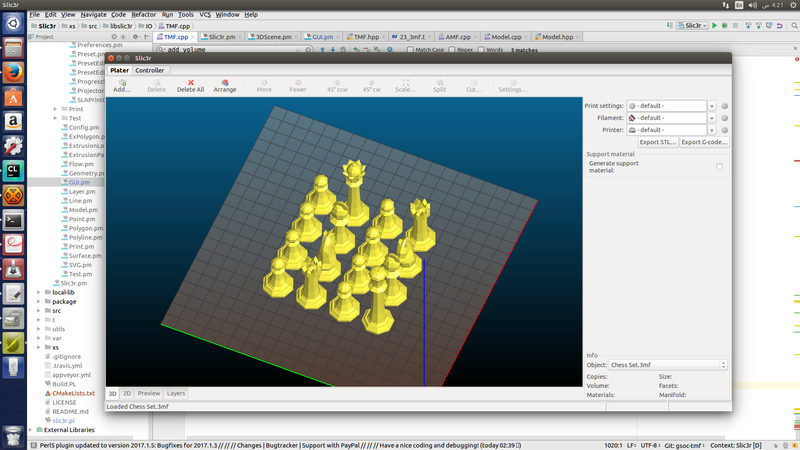 There exists many different groups and they may exist multiples of each group in the 3d model file. Read all 3mf materials (base materials, color groups, etc) in a new structure. ++    ///< It's a vector carrying pairs each has the material group type and its materials. This implementation has a problem since there we cannot add this material to a ModelVolume without messing with the current code. I know that currently Slic3r doesn't do anything with materials. then we will be able to use that to read and write materials without much pain but this will need handling that change when writing AMF. Continue using the current implementation but beside adding the material to it's material_gorup add it to the original ModelMaterials map (materials) and when we exporting to AMF we can ignore those material groups and accept base materials basematerials are like materials in amf. @alexrj @lordofhyphens what's the best way to handle this? (I haven't yet applied the transformation to the model instances). I have read a 3mf model sample and exported it into .obj. * Also, Here I read the same 3mf file in Slic3r. Convert the rotation matrix -> Quaternions -> Euler angles and call ModelObject:;rotate(Euler angle, axis). Read Build items (ModelInstances) without applying transformations yet. Get the rotation Euler angles from the transformation matrix. I only did as the code found in this link "ETdoFresh answer" @lordofhyphens Is this method correct? Get the scale vector by getting the magnitude of each base column. Get the rotation matrix by dividing each column with its scale factor (x or y or z factors). Read Slic3r custom configs for ModelObjects and ModelVolumes. Fix empty metadata as std::maps are not copied by default. Fix in 3MF read: When reading component tags. @alexrj @lordofhyphens I have a question regarding reading the item tag (which corresponds to creating the model instance of an object). Rotation angle around z axis. Rotation angle around x axis. Rotation angle around y axis. 3MF specification requires (is a must) applying the matrix. Do you recommend me to add those parameters to the ModelInstance or what's the case? For reading the transformation matrix in component tag (An object is a part of a bigger object) desn't have the previous problem as I create a copy of the component object apply rotation, translation and scale to the copied object then get the mesh and add it to volumes of the big object. // Create a copy of the current object. // Get the mesh of this object. // Delete the copy of the object. // Apply x, y & z rotation. 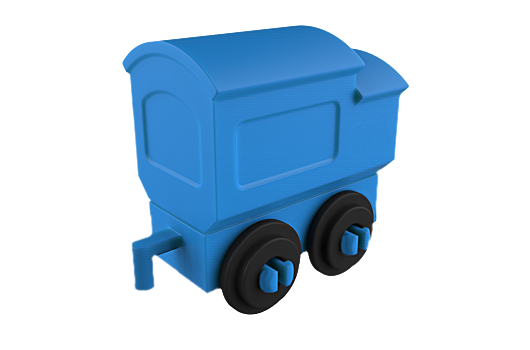 Read basematerials in the original model materials map. Fix fatal error in adding volume when reading 3MF model file. Those are 3mf models found in this repository. Improve write materials to adapt groups. Add translation z in the model instance. Add x, y rotation to the model instance copy constructor. Fixes in writing slicer:volume tag. Read Slic3r materials custom print configs. Complete support for the 3MF material extension. Currently, the code supports base materials and color groups. Fix (slic3r:volume) seg. fault during reading. Implement my own Zip lib based on miniz. @alexrj @lordofhyphens I need some overall code review. If there is something that needs modifications or improvements tell me. Model metadata and their Slic3r custom configs. Model materials and their Slic3r custom configs. Model Object, meshes, and their Slic3r configs. Model Instances and the transformation matrices. I will read a 3mf file and write it, then compare the output with the expected one. Add a simple read/write test for 3mf. Add another test for TMF::read(). @Samir55 I left my comments on the pull request (which is probably the easiest way, I find, to leave a code review on github). Revert change in slic3r.pl file and removed .DS_store files. Use initialize list in TMFEditor constructor. Add partnumber to ModelObject::swap() function called by assignment operator. Deleted xs/t/3mf/.DS_Store. Add a new line in the end of slic3r.cpp. Removed applying 3mf translation in the z_axis to the model instances. Add X&Y rotations, z_translation in 3D, 3D previews, and layers platers. To be applied when duplicating objects, etc. 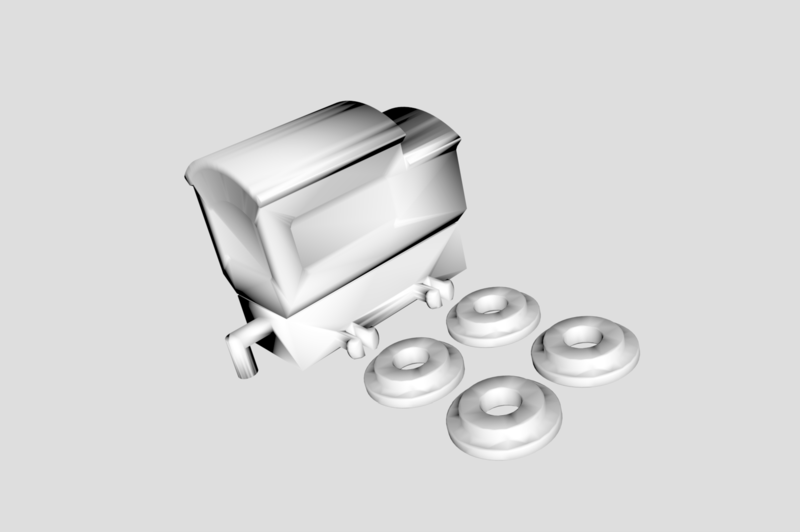 Add the parent object part number to the split objects. Initialize Model metadata - add 2 STL test files - add all 3d model test files in xs/models folder. @alexrj @lordofhyphens Why those 2 STL models give segmentation fault when adding I try to read them in Slic3r GUI. Parentheses missing around "my" list at /home/ahmedsamir/Slic3r/lib/Slic3r/GUI/Plater.pm line 1874. If I converted them using CLI into OBJ it worked. However if they are converted to 3mf, Slic3r gives segmentation fault. I tried to trace where this segmentation fault occurs, It is in TriangleMesh::repair() function. What's wrong with those 2 files? See if it still segfaults when exporting to AMF. Include X&Y rotation angles, scaling vector in the transformation matrix in item tag. Add 3MF file extension to GUI. @alexrj @lordofhyphens Sorry, I have not been working full time this week, I have been busy (changing our home wall paint). Undo to: rotate, flip, split, cut. Added some enhancements and a test. Add Basic UndoableOperation class in Plater.pm. @alexrj @lordofhyphens I have implemented my own zip wrapper. I will push those commits soon :), I am also working on adding undo/redo. Regarding the final evaluation and submitting my work, I will submit the link of the 3mf pull request. Does that seem fine? That should be fine (submitting the PR). It's been pretty good work I've seen so far. If you have the time, making a final pass over your code with -Weffc++ switch on (I mentioned it on IRC) may be helpful to you.